Nothing overly exciting happening this week in the kitchen - sorry folks! I've had a bunch of volunteer stuff going on and busy at work, too! But one of the things I have been eating a lot of lately is home made veggie curry that is vegan and literally thrown together! I can't even tell you what the ratios of ingredients were - again, sorry! What I can tell you is what I threw in! This veggie curry contains coconut milk, Earth Balance, Cashews, Spinach, Peas, Chickpeas, Tomatoes, Tomato Paste, various spices, etc. This made a HUGE HUGE HUGE batch! I ate leftovers for 3 meals AND froze a large container and just finished that up a few days ago. It was tasty! I have been doing a lot of loaded vegan nachos as a meal lately, too! This time of year I tend to get bored with food whether it be because it's hard to find good quality fresh produce and/or because I suffer from Winter Blues...that is yet to be determined. It's probably a little bit of both! That curry looks delicious, I never think to add cashews to my curries! I am so with you on the winter blues/bored with food thing. Bring on spring and summer produce! 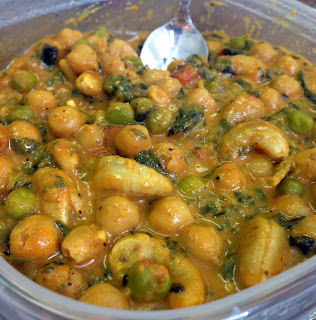 The curry looks great, love the use of cashews. Just tried one with avocado too that worked well.